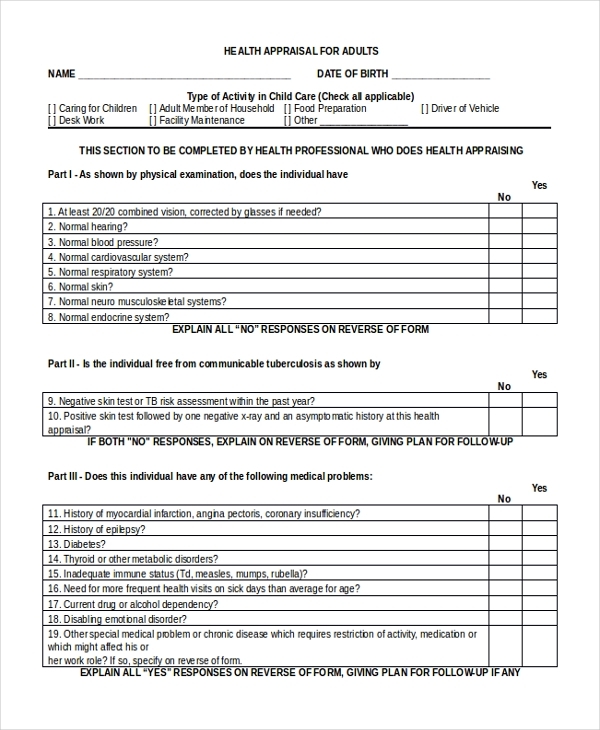 Any school can derive the information of their student’s health for judging their health risks if any, for participation in any sports event, by downloading this Health Certificate Appraisal Form template. Any company which looks after the licensing and regulatory affairs should download this Health Care Assistant Appraisal Form template. It can be printed after editing the content as required for use. 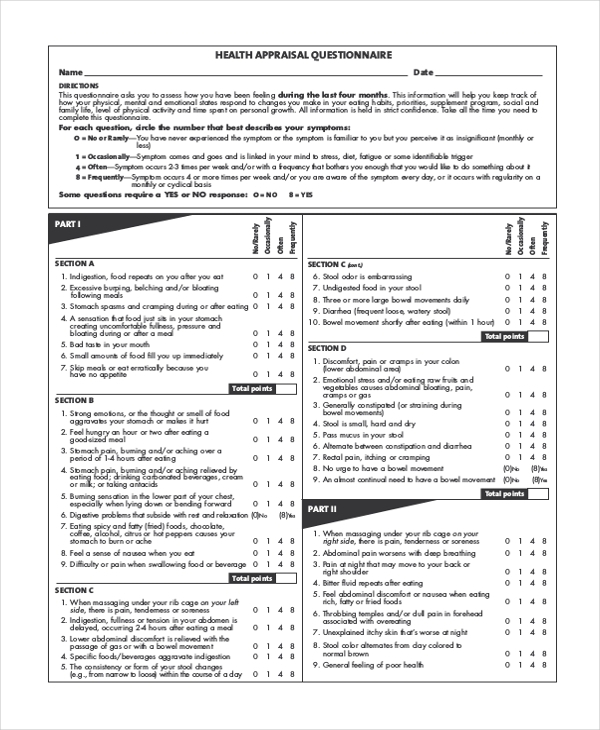 You can also see Teacher Appraisal Forms. 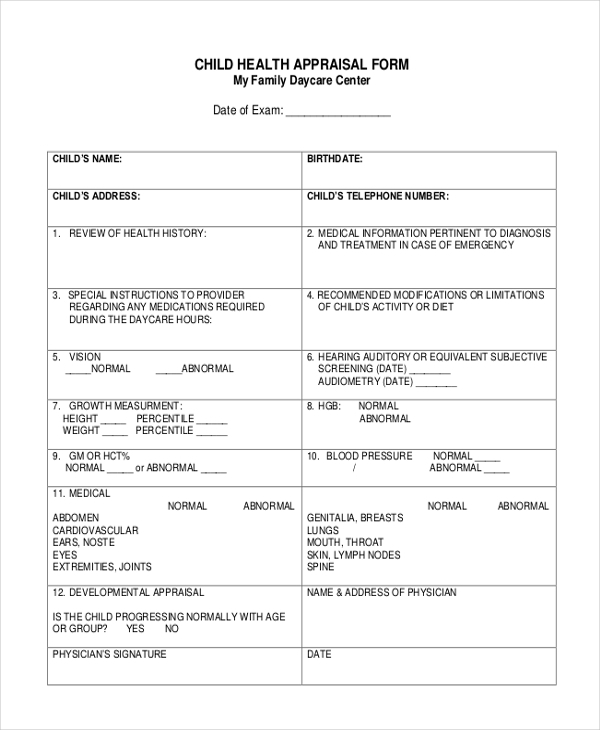 Any school or day care centers can download this Child Health Appraisal Form for accessing health condition of any child who has taken admission there. It can be customized completely. Physicians who examine a child for their health issues must gather information regarding the health risks of adults who the child is surrounded with. Download appraisal form for Adults for this. 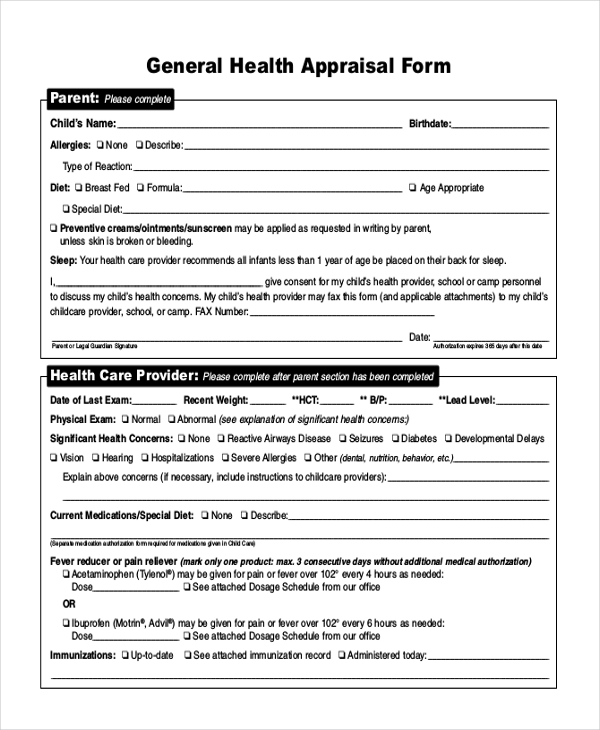 This General Health Appraisal Form is a must download for schools which wants to know about the health details and risks of their students for participation in any school activity, like sports or camping. You can also see Sales Appraisal Forms. 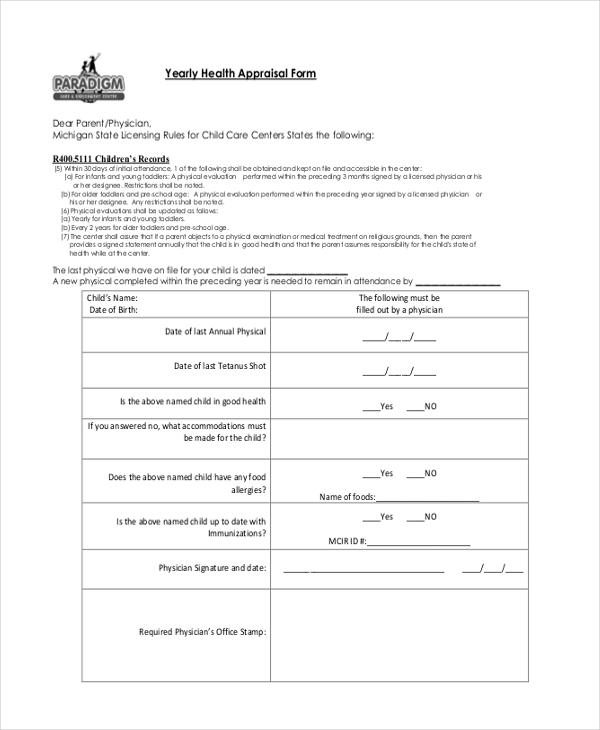 Any Daycare center can download this yearly Health Appraisal Form for accessing the health conditions of any infants and toddlers who take admission there. Just customize, print and use. This Health Appraisal Questionnaire form is completely apt for any organization, which is interested in accessing the health conditions and risks of their employees for proper implementation of health plans. You can also see Real Estate Appraisal Forms. 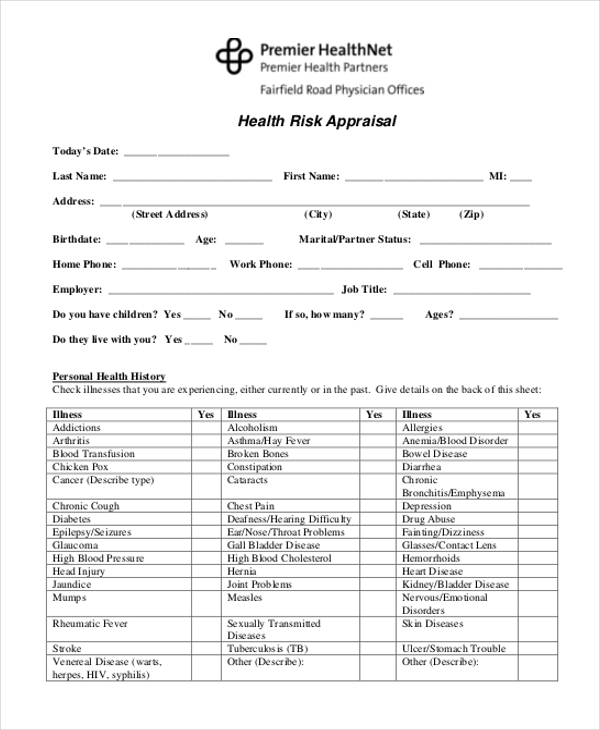 Any health care center can download this Risk appraisal form template for gathering information of individual’s lifestyle and health for accessing the health risks and providing a proper cure. Customize and print. Usage of Health Appraisal Form? Health appraisal or assessment for health risk is done for deriving knowledge about an individual’s health condition, which concerns their lifestyle and their physical health. The assessment is done by medical practitioners or health providers. This is done for the proper promotion of, self-realization concern, health risks which might happen with an unhealthy lifestyle, controlling and prevention of diseases if any. Health Appraisal form comes to use for gathering this knowledge in the form of a questionnaire. The Health Appraisal form templates in our collection are simply perfect and meant for everyone’s use. You can also see Annual Appraisal Forms. Target Audience or Benefits of Health Appraisal Form? 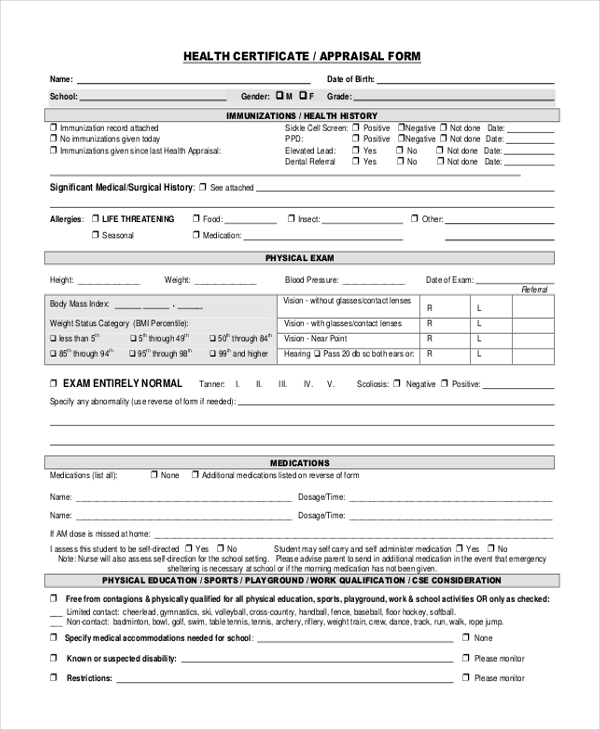 Any employer of a big concern may require these Health Appraisal form templates for proper health assessment of their employees, for gathering knowledge about their diseases, any past surgeries or if they have any allergies. Many schools, day care centers or any institutes may also download these templates for keeping a tab about the health of their students so that their ability to participate in various academic or sports activities can be derived. Found in mostly PDF and Microsoft Word formats, by using them, you can have a proper health record as well. You may also see Home Appraisal Forms. Simply browse through our collection, and find the most suitable Health Appraisal Form template which is 100 % ready for download. The questionnaires in these templates are designed in a very professional manner to serve your purpose. Fully customizable, simply edit the content of these templates and access health risks and promote prevention.